While operators of other rotary R&D tablet presses find it difficult to replicate dwell time, the velocity of the NP-RD30 can reach that of production presses, meaning dwell time can be more easily reproduced. Dwell time based on a 9.5 mm head flat ranges from 91 ms to 9.1 ms, which is shorter than any other rotary R&D tablet press. 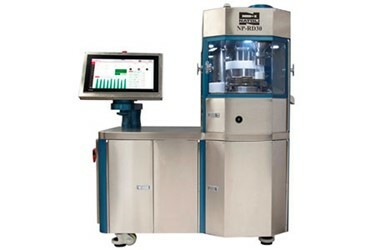 While designed to meet the needs of research and development teams, the NP-RD30 could be used as a small tablet production press. The NP-RD30 minimizes tablet defects by allowing researchers to discover potential tableting issues before production begins. It can determine formulation characteristics for successful tableting using minimal APIs, saving costs at the R&D stage. The NP-RD30 also easily replicates the dwell time and functionality of production presses.